In case you missed it, my publisher Debra Ross was on WNYT earlier this week talking about what you can do during those waning days of summer. You can watch it here. During our Westward Excursion Vacation we spent just a day in St. Louis, where we visited the unbelievably fabulous City Museum. I’d never heard of it before I did a little online research, and the truth is that the only reason why we were even in St. Louis is that it’s on our way home from Kansas City, and it’s good to have a little stop when you’re driving-driving-driving home. But, oh man, we loved it. 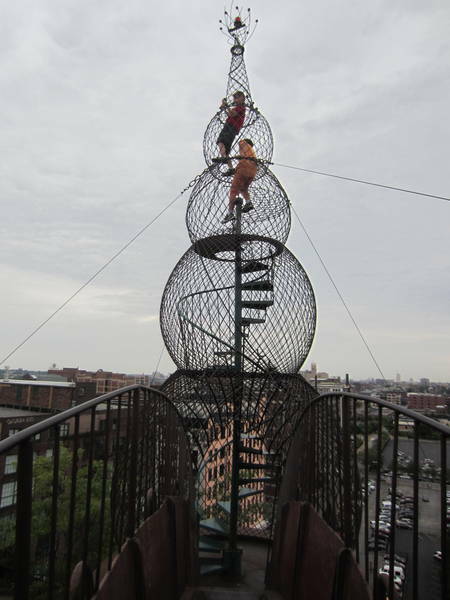 It’s like a high ropes course/indoor-outdoor sculpture park/insanely awesome playground. Like, here’s a crazy staircase in a turret on the roof. And here’s M climbing around inside. Anyway, we loved it SO much that I ended up pitching a post to All Over Albany because I’d much rather have a super-fun and active playground-y sort of something than an aquarium. I like fish alright. It’s just that my kids and I get tired of looking at tanks. And we get cabin fever in the winter. And I sort of feel like animals-as-entertainment is on its way out as a pastime. And also, driving to St. Louis takes a very, very long time. Anyway, you can go over and take a look at my pitch on AOA.